Cosy up with Societi Bistro's .. The Electric - the edgiest jui..
Each course is different according to the season and availability in the gardens and the bush. Join Roushanna Gray and explore the gardens, discover and pick edible flowers, weeds and fresh organic vegetables. Forage for indigenous edibles, learn how to sustainably harvest them, utilize them in your kitchen, grow them in your garden and some of their medicinal properties. Learn about wild herbs and how to preserve and prepare them. After snacks and a gathering tour, you will get creative in the foraging classroom kitchen and prepare and share a feast. Join Roushanna Gray on this exciting winter forage led by avid mushroom hunter Justin Williams as they delve into the forest to learn all about the magical world of mushrooms. You will be meeting in the morning and start with an educational and informative talk about wild mushrooms, followed by an exploratory foray into the forest, ending with a picnic. Join Isabella Niehaus and experience Langtafel op die Duin. Isabella holds a variety of shared foodie feasts and workshops at her Langebaan home. I attended one of of Ginger & Lime’s fun and interactive cooking classes last year and really enjoyed the experience. Hop over here to see my review. They offer a variety of themed cooking classes each month. For a great list of winter restaurant specials hop over to Southern Vines. Welcome Home | Design Store is a collaborative exhibition opening on Thursday 5 July. Join them for a celebration of local design while sipping on drinks and shopping for your home. Fabrica are launching their new collection, Unmasked, featuring never before seen rugs as well as sculptural pieces (These look amazing!). Stay Evil Kids are exhibiting their brand new stone and mirror collection and Douglas & Company are showing some of their iconic furniture pieces. Her ongoing investigation into human relationships with spaces of leisure imaginatively comments on the distancing between people and the wildness of the natural world. She playfully depicts tigers and deer in images of parks and topiaries and inserts a wry humor into her scenes of swimmers and sunbathers on flat picture planes of blue, pink and green. Slow Afternoon will be taking place on the 19th of July at The Modern Heirloom in Stellenbosch. Expect three beautifully styled spaces where you can get creative, take photos and build your photography portfolio. Bright Day offers a number of different art classes and workshops at their Woodstock studio. Clay & Sip is a fun and unique way to uncork your creativity as an experienced local potter takes you step by step through the process of unleashing your inner artist while you paint a unique piece of crockery to add to your kitchen collection. These leather crafting courses are presented by a young and vibrant team that will challenge you to explore your creativity. No previous experience? No problem! By the end of this five-day course you will be amazed at what you have accomplished. You will be the proud owner manufacturer of a superior quality leather belt and bag, every hole punched and stitch sewn by yourself. On the 2nd and 4th Tuesdays of each month, Alliance Française du Cap hosts a free screening of a French feature film in French with English subtitles. Everyone is welcome. Think warm Glühwein, great food, live music & awesome South African products in a beatiful setting, on the lawns at The Roundhouse. Save the date for SA’s French inspired 25th annual Franschhoek Bastille Festival, which takes place at the historic Franschhoek Huguenot Monument. A social calendar highlight, the weekend long event is guaranteed to bring out the Parisian in you. Join Terra Botanica, Madison Boutique, Gia Bardot, The dot collection, Emma Brink Designs, Claire Denarie Art & African Lab Design for an exclusive shopping experience. Stunning views, beautiful setting and single track trails. Hop over here to enter and to find more listings. Run through the Vrede en Lust Estate vineyard on the slopes of the Simonsberg mountain and experience some of the most spectacular views on offer in the Paarl/Franschoek region. Join Cape Town Retreats to completely detoxify your body and your mind and to recharge your mental and physical health. 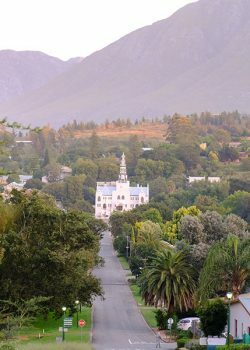 The retreat home is a beautiful guest house just outside Tulbagh, surrounded by mountains and quiet. Read about my experience here, it’s something I highly recommend!